It was hard for Katarina in the weeks after she had visited the General. Her anger against this man who had pushed her mother to her death had kept her on her feet. Neither Cecile nor Katarina had wanted to visit their mother while she laid out in the morgue. The twin sisters wanted to keep the image they had of their mother while she was alive. At the advice of the General they also had refused visits of acquaintances because the investigation was still ongoing. Jean-Pierre, in the meantime, had recovered very well. Every day he gained a bit of strength and with the help of a recognized physiotherapist, he could use his body again as before the bullet wound. He tried to cheer up his girlfriend and searched different things to distract her. He tried to indulge her with a good glass of wine and a delicious meal and nonetheless Katarina appreciated his attempts, she couldn’t enjoy it really. Mourning needed time, Jean-Pierre thought and he didn’t criticize her for that. After a few weeks, Katarina started to smile again when he was with her. He knew this was a good sign, but didn’t try to hurry things. Their love for each other in these weeks was limited to tender kisses and some cuddling. Jean-Pierre knew what it was to lose a mother. He had lost his parents when he was very young. His mother always had occupied a special place in his life and that’s why he could so much relate to Katarina’s grief. In the meantime, he also had gotten his share of bad luck. He discovered a registered letter and a subpoena in his mailbox that was sent to him while he was with Katarina. The registered letter was his resignation as an accountant. He couldn’t blame his employers. Anyway, he had chosen for his new life and about that he had no remorse. The subpoena, however, was a cold shower. His employer had engaged a lawyer and had accused him of breach of contract. The amount of money he asked would cost him a great part of his savings. For a moment, he started to sweat when he made the calculation. But that was nothing compared to what Katarina had to endure. Katarina started slowly to enjoy life again. After a few weeks, she had taken the management of the castle upon her shoulders. She didn’t know if she would be a good businesswoman. At least she would try, even if she just did it in memory of her late mother, Baroness Beatrice. Jean-Pierre liked the changes with his girlfriend. He asked her how business was going and if she wanted he loved to help her with his accountant knowledge, but she always refused his help. She had promised him he would have a better life and she wanted him not to worry about money matters and profit. Cecile had taken care that Jean-Pierre after the unfortunate death of the Baroness was housed in one of the houses the Baroness owned not far from the castle. From the moment he could drive a car, he hired a rental car to travel between his domicile and the Chateau Dauphin. A month after the meeting with the General, Jean-Pierre wanted to take his car to drive back to the castle. His surprise was great when he saw a black limousine before his door. The chauffeur of the castle invited him to take place in the empty automobile. In a quarter of an hour, he drove him to the place he had visited so many times in the past weeks. 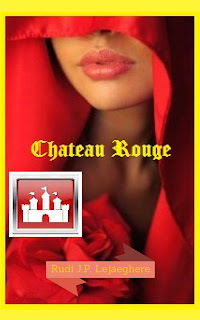 When the limousine stopped and he got out of the car, he saw Katarina, dressed in fabulous red evening dress, standing on the stairs of the castle. Her face shone with a beautiful smile and in her eyes he noticed a naughty glance. This was the woman in red he had fallen in love with and suddenly his heart started to beat faster. She led him through the hall, up the stairs which took them to the rooms. Jean-Pierre looked at her on his side, but she only smiled without telling him what she was up to. ‘What, Katarina, you have sold the castle, is that a good decision now, you have done this thoughtfully?’ Jean-Pierre knew she had a lot of emotional bindings here, to cut them would maybe not a very good decision. ‘Sorry, darling, I thought the castle needed a new approach. I hope the new owner likes it as much as I do.’ She pointed on the nameplate on the door. Jean-Pierre read it with surprise. ‘Chambre Jean-Pierre!’ He turned to Katarina who pushed herself against him and kissed him passionately. He was too astonished to react properly. His brain had tilted. ‘What do you mean by that, is it still your castle or…?’ That was the only question he could ask between two burning kisses. ‘Hey, that’s a good name, honey, you know I love the color red, but I still love you more. And that’s why I want you now… all for myself.’ She pulled him through the door opening of the room and closed the door behind her. ‘Let me serve you, my Lord.’ She opened his shirt and kissed him on the healing scar of the bullet wound. This was the beginning of a passionate dance. They were two tango dancers who knew every movement of each other and danced it with love. Jean-Pierre already was hankering after this intimate dance and was leading the first steps. He stripped her of her beautiful red dress and noticed that she, supposedly for the opportunity, had clothed herself in red lingerie. He caressed her body through this clothing. Katarina didn’t sit idly because a tango takes two. A few seconds later she stood naked before him while he answered with his own nakedness. In a passionate duel, they kissed and caressed each other. Both couldn’t get enough of it. Jean-Pierre took Katarina’s arm and led her to the poster bed where they lay themselves upon together. He rediscovered known places and danced further on with his lips and fingers, while she, groaning with pleasure, followed the melody of the dance. Nothing was still of importance around them. Only their love and passion counted. Soon they came in a whirlpool of movements to the grand finale of their dance that underlined their oneness. Both Katarina and Jean-Pierre knew that if they had to choose, this should last forever. Just a little pause, my dear readers. ‘The Woman in Red’, Katarina eventually has found her real love and soul partner after 55 chapters in the person of Jean-Pierre. Maybe there are amongst you who are asking if you still will hear from Katarina and Jean-Pierre? Or is this really the end of their adventures? The answer is yes, they’ll come back and no it has not ended yet.